Edward Teach (c. 1680 – November 22, 1718), better known as Blackbeard, was a notorious English pirate in the Caribbean Sea and western Atlantic during the early eighteenth century, a period referred to as the Golden Age of Piracy. His best known vessel was the Queen Anne's Revenge, which is believed to have run aground near Beaufort Inlet, North Carolina in 1718. A flag often attributed to Blackbeard. Blackbeard often fought, or simply showed himself, wearing a big feathered tricorn, and having multiple swords, knives, and pistols at his disposal. It was reported in the General History of the Pirates that he had hemp and lighted matches woven into his enormous black beard during battle. Accounts of people who saw him fighting say that they thought he "looked like the devil" with his fearsome face and the smoke cloud around his head. This image, which he cultivated, has made him the premier image of the seafaring pirate. Blackbeard's real name is thought to be Edward Teach. Nevertheless, he is referred to in some documents as Edward Thatch or even Edward Drummond. He is thought to have been born in Bristol, but some writers claim London, Philadelphia, or Jamaica as his home. Teach went to sea at an early age. He served on an English ship in the War of the Spanish Succession, privateering in the Spanish West Indies and along the Spanish Main. After Britain withdrew from the war in 1713, Teach, like many other privateers, turned to piracy. According to Charles Johnson, Blackbeard fought a running duel with the British thirty-gun man-of-war HMS Scarborough, which added to his notoriety. However, historian David Cordingly has noted that the Scarborough's log has no mention of any such battle. Before he sailed upon his adventures, he married a young creature of about sixteen years of age … and this I have been informed, made Teach's fourteenth wife … with whom after he had lain all night, it was his custom to invite five or six of his brutal companions to come ashore, and he would force her to prostitute herself to them all, one after another, before his face. Teach had headquarters in both the Bahamas and the Carolinas. He lived on the island of Nassau where he was named the magistrate of the "Privateers Republic." Governor Charles Eden of North Carolina received booty from Teach in return for unofficial protection and gave him an official pardon. He left Nassau to avoid meeting with Royal Governor Woodes Rogers, unlike the majority of the pirate inhabitants who welcomed the governor and accepted the royal pardons he brought. Blackbeard operated in coastal waters; it was difficult for ships of the line to engage him in battle. As such, two smaller hired sloops were therefore put under the command of Lieutenant Robert Maynard, with instructions from Spotswood to hunt down and destroy Blackbeard, offering a reward of £100, and smaller sums for the lesser crew members. Maynard sailed from James River on November 11, 1718, in command of thirty men from HMS Pearl, and twenty-five men and a midshipman of HMS Lyme, and in command of the hired sloops, the Ranger and Jane (temporarily commissioned as His Majesty's Ships to avoid accusations of piracy themselves). Maynard found the pirates anchored in a North Carolina inlet on the inner side of Ocracoke Island, on the evening of November 21. Maynard and his men decided to wait until the following morning because the tide would be more favourable. Blackbeard's Adventure had a crew of only nineteen, "Thirteen white and six Negroes," as reported to the Admiralty. A small boat was sent ahead at daybreak, was fired upon, and quickly retreated. Blackbeard's superior knowledge of the inlet was of much help, although he and his crew had been drinking in his cabin the night prior. Throughout the night Blackbeard waited for Maynard to make his move. Blackbeard cut his anchor cable and quickly attempted to move towards a narrow channel. Maynard made chase; however his sloops ran aground, and there was a shouted exchange between captains. Maynard's account says, "At our first salutation, he drank Damnation to me and my Men, whom he stil'd Cowardly Puppies, saying, He would neither give nor take Quarter," although many different versions of the dialogue exist. Eventually, Maynard's sloops were able to float freely again, and he began to row towards Blackbeard, since the wind was not strong enough at the time for setting sail. When they came upon Blackbeard's Adventure, they were hit with a devastating broadside attack. Midshipman Hyde, captain of the smaller HMS Jane, was killed along with six other men. Ten men were also wounded in the surprise attack. The sloop fell astern and was little help in the following action. Maynard continued his pursuit in HMS Ranger, managing to blast the Adventure's rigging, forcing it ashore. Maynard ordered many of his crew into the holds and readied to be boarded. As his ship approached, Blackbeard saw the mostly empty decks, assumed it was safe to board, and did so with ten men. Maynard and Teach themselves begun the fight with their swords, Maynard making a thrust, the point of his sword against Teach's cartridge box, and bent it to the hilt. Teach broke the guard of it, and wounded Maynard's fingers but did not disable him, whereupon he jumped back and threw away his sword and fired his pistol which wounded Teach. Demelt struck in between them with his sword and cut Teach's face pretty much; in the interim both companies engaged in Maynard's sloop. Later during the battle, while Teach was loading his pistol he finally died from blood loss. Maynard then cut off his head and hung it from his bow. Another legend published in coastal North Carolina holds that Captain Teach's skull was used as the basis for a silver drinking chalice. The author, later a North Carolina judge, claimed to have drunk from it one night in the 1930s at a closed dinner while in college. There is significant evidence supporting the claims that Teach was prone to burying treasure. In times as desperate and difficult as the American Revolution, it was common for the ignorant, credulous, and desperate to dig along these banks in search of hidden treasures; impostors found an ample basis in these rumors for schemes of delusion. A ship believed to have been Blackbeard's was discovered near Beaufort, North Carolina, in 1996, and is now part of a major tourist attraction. Blackbeard appears as a character in Stephen Vincent Benét's drama, The Devil and Daniel Webster (1937). He is part of the Jury of the Damned summoned by the Devil. Robert Louis Stevenson's Treasure Island contains two references to Blackbeard. (1883). 1) Squire Trelawney: "Blackbeard was a child to Flint." 2) In the book, one of Long John Silver's pirates is named Israel Hands, after one of Blackbeard's officers. In Marvel Comics, Doctor Doom sends the Fantastic Four back in time to find Blackbeard's treasure, but events unfold in such a way that the Thing turns out to be Blackbeard. Blackbeard appears in the 1967 episode of the Spider-Man cartoon series, "The Night of the Villains." In DC Comics, the immortal Vandal Savage took the alias Edward Teach and earned the nickname "Blackbeard." He later faked his own death. A character named Blackbeard (Marshall D. Teach instead of Edward Teach) is one of the most powerful pirates in the world of One Piece. Another pirate, Whitebeard, is known by the name Edward Newgate, taking the remainder of the real Blackbeard's name. Blackbeard appeared in one of the Time Warp Trio book series titled, The Not-So-Jolly Roger. The 1986 DC Comics mini-series, Watchmen features a fictional pirate-themed comic book called "Tales of the Black Freighter." It features horror stories surrounding a ship from hell, crewed by the damned and captained by Edward Teach. In the 2002 Novel, Plum Island by Nelson Demille, the plot revolves around the discovery of Blackbeard's treasure. J. Meade Falkner's novel Moonfleet centers around John Trenchard's discovery of the last resting place of Blackbeard and his hidden treasure. Blackbeard made a slight appearance in Percy Jackson and the Sea of Monsters as a prisoner on Circe's Island, there he is a son of Ares. Blackbeard is the chief antagonist of the main character John Chandagnac and a Vodou sorcerer in Tim Powers' 1988 novel, On Stranger Tides. 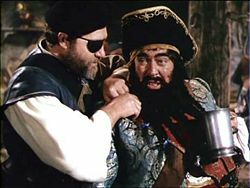 Peter Ustinov played the title role in the 1968 film comedy Blackbeard's Ghost. In June 2006, Hallmark Entertainment premiered a three-hour presentation of Blackbeard, a fictional account of Edward Teach, starring Angus MacFadyen (from Braveheart) as the pirate. Originally filmed as a four-hour mini-series, the full version has been released abroad and on DVD. Shot entirely on location in Thailand, the film was directed by Kevin Connor and written by Bryce Zabel. Although many of the names and places are accurate, this Blackbeard is essentially a fictional story about the pirate's obsession to find the missing treasure of Captain Kidd. Malachi Throne portrayed Captain Teach in an episode of Voyage to the Bottom of the Sea (TV series). In the 4th season episode "Blackbeard Returns" the crew of the Seaview discover the resting place of Queen Anne's Revenge and subsequently have to battle the presence of Blackbeard's ghost as the legendary scalawag tries to turn the crewmen into pirates. On the Simpsons' "Treehouse of Horror IV: The Devil and Homer Simpson," the Devil summons a "Jury of the Damned" to determine whether Homer should go to hell for exchanging his soul for a doughnut (this was inspired by "The Devil and Daniel Webster"). One of those chosen to be on the jury is Blackbeard. After Marge informs him that the only chair left to sit on is a baby's high chair, Blackbeard responds in a tautology, "Arr! This chair be high, says I!" Later, when trying to read Homer's note, he says "Looks to be some kind of treasure map!" Benedict Arnold snatches it from him, chiding him for not being able to read. Blackbeard blames that as the cause of his debauchery. Blackbeard can be seen sitting next to a customer in the Krusty Krab in the SpongeBob SquarePants episode, "Sailor Mouth." Snopes, a website that normally investigates and verifies the truth of urban legends, created a false rumor that the rhyme Sing a Song of Sixpence was used as a recruitment tool by Blackbeard. TLC (The Learning Channel) was taken in by this farce, and broadcast it as fact during one of their shows. The board game urban myth also fell for the spoof. Snopes claims they created the spoof to test readers' ability to use their common sense to judge for themselves the likelihood of urban legends. In the Time Warp Trio episode, "The Not so Jolly Roger," Fred, Sam, and Joe, are forced to join Blackbeard's crew. One of the artifacts on Legends of the Hidden Temple was "Blackbeard's Treasure Map." Part of the History Channel's True Caribbean Pirates deals with Blackbeard. In the series Jack of All Trades, starring Bruce Campbell, Blackbeard appears in an episode where he is hired by the French to kidnap Benjamin Franklin. In the game Sid Meier's Pirates! Blackbeard plays a minor role as a rival pirate (at the start of the game, Blackbeard is the 2nd most notorious pirate in the Caribbean) (1987 and 2004). 'Baltor the Blackbearded' appears in the Sega Dreamcast game Skies of Arcadia. His ship is called 'The Blackbeard', and Baltor himself resembles Blackbeard. Blackbeard was the featured centerpiece of the famous Disney Park attraction Pirates of the Caribbean from 1967 to mid-2006, when he was replaced by Captain Hector Barbossa from the Pirates movie franchise. A painting of Blackbeard hangs in Van Der Veer House (ce. 1790), in Bath. 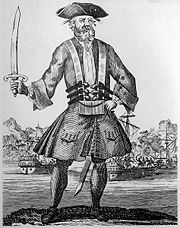 Blackbeard was one of the many famous pirates reviewed in the Discovery Channel program, True Caribbean Pirates, along with Henry Morgan, Mary Read, Anne Bonny, and Black Bart Roberts. A 2-hour special on National Geographic called Blackbeard: Terror at Sea, in which a narrative is given about Teach's adventures. A shipwreck that experts claim belonged to Blackbeard is currently being excavated off the North Carolina coast. ↑ 1.0 1.1 Perry, 14. ↑ Queen Anne's Revenge Online, Education. Retrieved December 18, 2007. ↑ Norman C. Pendered, Blackbeard: The Fiercest Pirate of All (Random Lake, WI: Times Printing Co., 1975). ↑ Blackbeard Festival, Blackbeard Pirate Festival. Retrieved December 18, 2007. ↑ Royal Navy, Sussex. Retrieved December 18, 2007. ↑ IMBD, Blackbeard's Ghost. Retrieved December 18, 2007. ↑ IMBD, Blackbeard. Retrieved December 18, 2007. ↑ Snopes, A Pocket Full of Wry. Retrieved December 18, 2007. ↑ Snopes, 'Sixpence. Retrieved December 18, 2007. ↑ Snopes, With Sixpence You Get Eggroll on Your Face Retrieved December 18, 2007. ↑ Snopes, False Authority. Retrieved December 18, 2007. Blackbeard Festival. Homepage. Retrieved December 18, 2007. Cordingly, David. Under the Black Flag: The Romance and the Reality of Life Among the Pirates. Fort Washington, PA: Harvest Books, 1997. ISBN 0-15-600549-2. IMBD. Blackbeard's Ghost. Retrieved December 18, 2007. IMBD. Blackbeard. Retrieved December 18, 2007. Pendered, Norman C. Blackbeard: The Fiercest Pirate of All. Random Lake, WI: Times Printing Co., 1975. Perry, Dan. Blackbeard: The Real Pirate of the Caribbean. New York: Thunder's Mouth Press, 2006. ISBN 1-56025-885-3. Queen Anne's Revenge Online. Blackbeard's Treasure found! Finding the QAR (Queen Anne's Revenge). Retrieved December 18, 2007. Queen Anne's Revenge Online. Education. Retrieved December 18, 2007. Royal Navy. Sussex. Retrieved December 18, 2007. Snopes. False Authority. Retrieved December 18, 2007. Snopes. A Pocket Full of Wry. Retrieved December 18, 2007. Snopes. Sixpence. Retrieved December 18, 2007. Snopes. With Sixpence You Get Eggroll on Your Face. Retrieved December 18, 2007. This page was last modified on 22 September 2017, at 20:12.